A New and Accurate Map of the Kingdom of Hungary and Principality of Transilvania with the Bordering Countries. 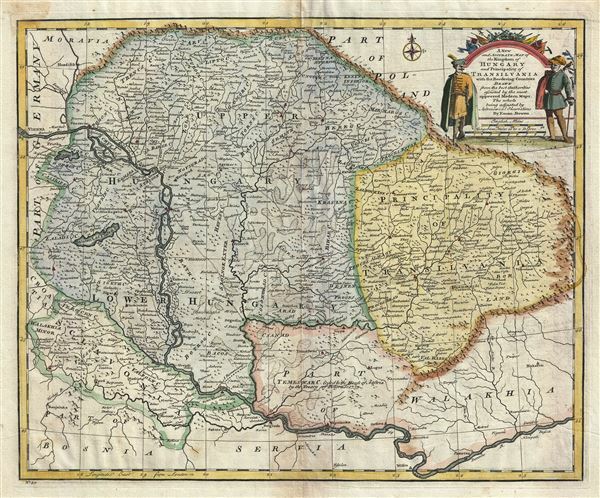 An attractive 1747 map of Hungary and Transylvania (part of modern day Romania) by the British cartographer Emanuel Bowen. The map covers the region from the Carpathian Mountains south as far as the Danube River, including parts of modern day Hungary, Romania, Slovakia, and Serbia. Several towns, rivers, mountains, roads and other topographic features are noted. Color coded according to territories and regions, mountains are beautifully rendered in profile. The map identifies a 'Roman Camp' northwest of Belgrade. The region of Temeswar is noted to be 'Ceded to the House of Austria by the Treaty of Belgrade 1739.' The Treat of Belgrade, a peace treaty between the Hasburg Monarchy and the Ottoman Empire, was signed post the Austro-Russian-Turkish War of 1735-1739. A title cartouche is included in the upper right quadrant of the map that includes a beautiful illustration of two noblemen. This map was prepared by Emanuel Bowen as plate no. 30 for the 1747 issue of A Complete System of Geography. Very good. Minor wear along original fold lines. Original platemark visible. Blank on verso. Overall age toning. Rumsey 3733.029. Philips (atlases) 614 (1752 edition).